Thought I would share last nights work on the Foden. 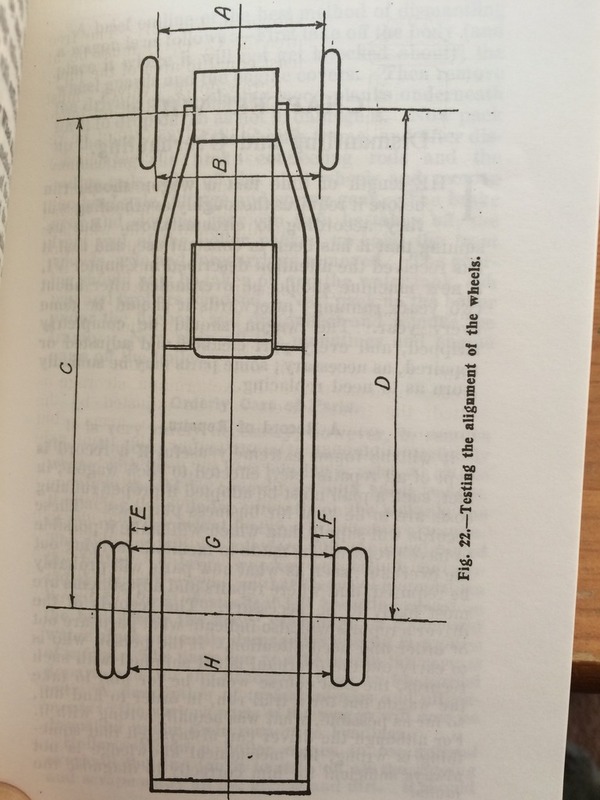 I have often thought that the Foden wheels were not in correct alignment, which was causing a considerable amount of power to be wasted for the wheels. Instead of simply rolling on the ground they are continually being pushed sideways, causing excessive friction. I had eye balled the front wheels a few times in the shop and it looked to me that they were not parallel to each other, and seeing a video of the Foden running it really looked in the video that the Foden was ''crab walking''. So.... I put the steering in mid position and measured distances a and b. My eye was correct distance b was 1/2'' greater than a. An adjustment was made to the rod that connects to two wheels together to bring the wheels parallel to each other. I than measured the distances c and d to test if the radius rods are correctly adjusted. I also measured the length of the radius rods. Measurement c was 11/16 smaller than d, the radius rods also confirmed this. Corrective Adjustments were made and the result is the Foden now rolls a lot more freely in the workshop. I had a friend who had an XJS Jag with the same problem, wore tyres out pretty quickly!